If you have always dreamed about beautiful wavy locks but just lack the length and needed volume, you might want to consider hot fusion extensions. AiryHair glue based, body wave U-tip extensions will instantly give you the look you have always wanted. Having hair that looks lifeless and lacks thickness and shine can be very disappointing and that’s why more and more women are using extensions in order to enhance their look. Glue extensions are very popular because they can be easily attached with the hot fusion method that has become very common lately. It is a semi-permanent method which means it will last you for several weeks before it is refitted again. It also means you won’t have to take off your wavy extensions every day, like you have to with the clip-in method. This makes glue extensions perfect for busy women who don’t have too much time for their hair each day. Once you install them, you’re good to go and the body wave will look just perfect every day with minimum styling. Another reason why we recommend hot fusion extensions is because they don’t require much effort for installation. The process is quite simple and you can even learn how to do it yourself which will save you a lot of money. 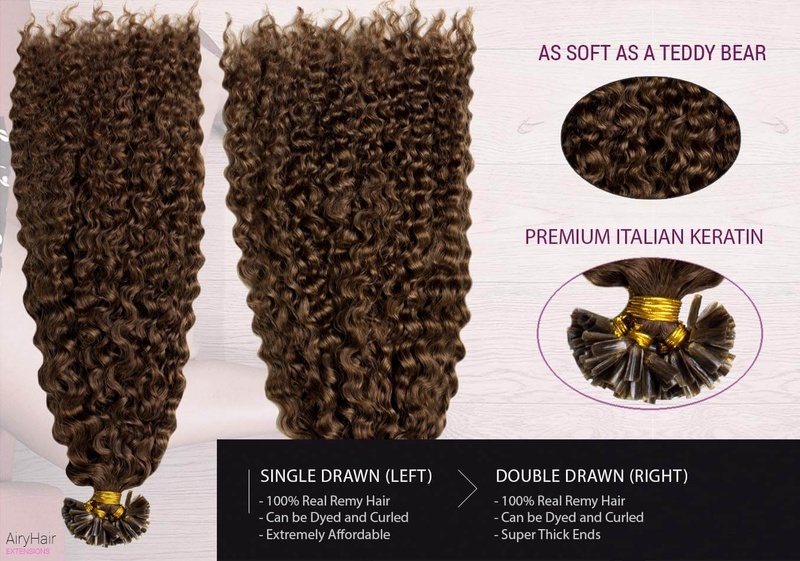 If you’re not quite sure how the hot fusion extensions work or need more information about our product, read on, and learn about all the features of keratin body wave, how to apply it and care for it. Because our glue body wave extensions are applied by using the hot fusion method, they are a real breeze to attach. By following our simple instructions, you can even do it yourself and save money and time. It is a strand by strand method that allows you to hide your extensions more easily as well as completely control the density. 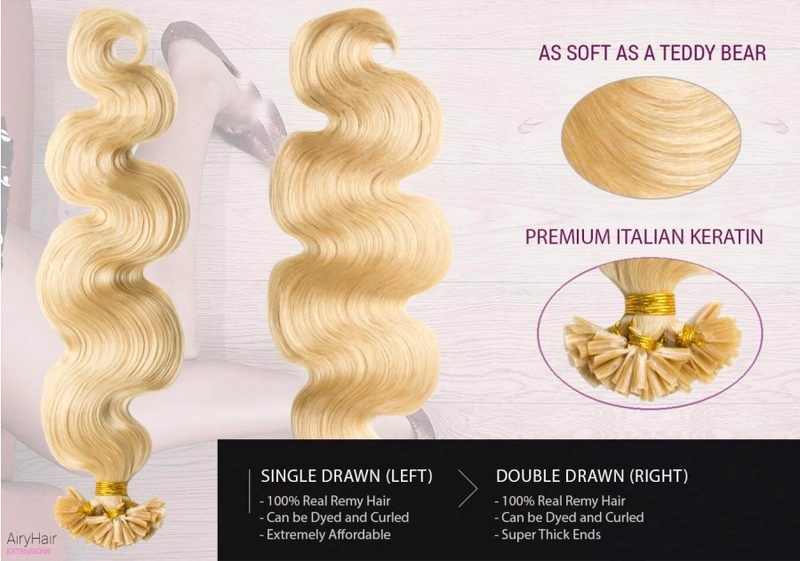 AiryHair glue body wave extensions are indistinguishable from your real locks and will blend in just right so you don’t have to worry about the tips being visible. All the hair used to make our extensions is top quality, real Remy hair. All the strands are pre-bonded and glue is used which is perfectly safe for your hair. You don’t have to worry about any damage or harm to your tresses. The beautiful soft wave will add an extra dimension to your look and will stay the same throughout your use. Your glue hair extensions pack will include 100 strands. We want all of our customers to be able to customize the extensions so we offer you many colors, different weights that control the density, as well as amazing textures like body wave. There are 100 U-tip strands in the package, pre-bonded with glue and ready for use immediately. 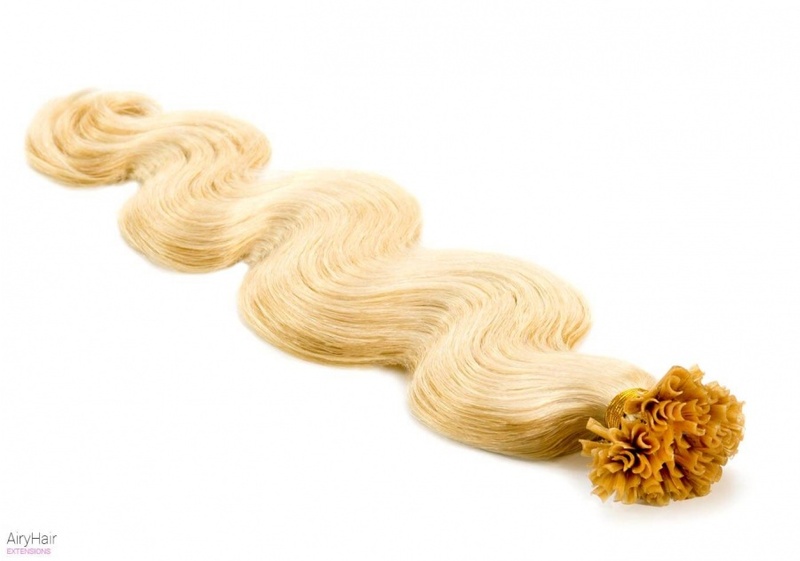 Each of the wavy strands is connected to your real hair by melting the glue and fusing both together. After this easy process is completed, you can enjoy your extensions and wear them for weeks! But do keep in mind that hot fusion extensions need to be reinstalled after that. As your natural strands grow, the tips will be moved further down and if not refitted will become visible and that’s not what anybody wants. So make sure you reapply your glue body wave in time and avoid the risk of putting too much strain on your hair. You do not need to buy new strands, they simply need to be moved higher up. Should I get single or double drawn hair? Density and volume of the hair is the main difference between double drawn hair and single drawn hair. Double drawn means that all the strands have manually been checked and all the shorter hairs have been discarded. That results in equal strand length from top to bottom and greater density of the extensions. With single drawn, you get much thinner hair that is not equally thick. So if you’re looking for amazing volume, double drawn should be your choice. Is your hair Remy? Yes. 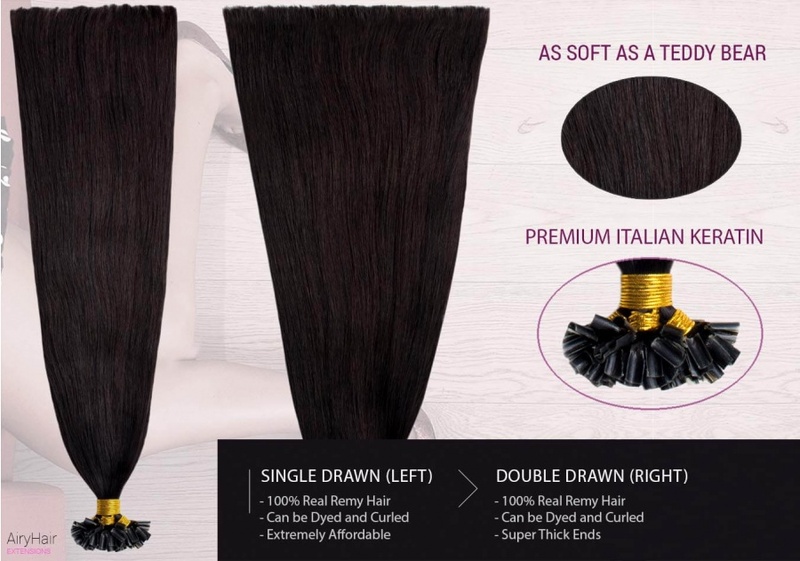 If you’re looking for top quality hair, then Remy is your best choice. It is unmatched when it comes to durability, volume, and quality. Remy stands for hair that has been collected from one human donor and has all the cuticles. These are facing the same direction which means it will tangle a lot less and last for a longer period of time. However, there are some stores that sell fake Remy hair. Those strands are not high quality because the cuticles are removed by a chemical process. That results in extensions that tangle and knot and simply do not look as good. If you want something that will last you for a long time, make sure to buy genuine Remy hair. How to Apply Glue Hair Extensions? 1. Wash your hair beforehand and comb it. 2. Check that the extensions color matches your own perfectly and that the length is right. If everything looks great, you can proceed with the application. 3. All of the U-tip strands should be placed in a couple of layers, starting from your neck. You can also place some at the sides, but don’t go too high up because you don’t want the tips to show. 4. Start with the first layer just above your neck. Section off the hair, and clip everything else up. From that layer, separate multiple small strands and make sure there’s enough space between them. 5. Take the first keratin extensions and melt the glue with the hot fusion tool. When it’s nice and sticky, apply it to the first strand. Roll the tip between your fingers in order to connect it properly. Do not place the tips too close to your roots because that put too much strain on your hair and prevent it from growing properly. 6. Repeat the same process for each strand on the first layer. Now separate another layer higher up and do the same thing. Be very careful when handling the hot tool and attaching the extensions because it’s not so simple to remove them right away. 7. When you’re done, avoid washing your hair for one or two days. How to Remove Keratin Hair Extensions? Because your body wave is glued to your natural tresses, it will grow out after a couple of weeks, depending on how fast your strands grow. That is the time when you should remove the extensions and reapply them again. The removal is very simple if you have an adhesive remover and the hot fusion crushing tool. 1. Decide whether you want to start from the top or the bottom. 2. Find the first bond and move away any strands around it. 3. Apply keratin remover and press the bond with the fusion crusher tool. You will notice that the strands can be easily removed now. Repeat this strand by strand until you have removed all of them. 4. There will be some glue residue on your locks so apply more adhesive remover and brush it out. After that, wash your hair. And that’s it! If you have additional questions about installing or removing hot fusion extensions, contact a hair professional. If you don’t have a lot of experience and don’t want to do it yourself, you have them installed at a salon. How Should I Care for U-Tip Hair Extensions? How are U-Tip Hair Extensions Shipped to Me?